is a high-quality, innovative laboratory device. It allows the analysis of the autofluorescence of the metabolic enzyme NAD (nicotinamide adenine dinucleotide) present in the reduced form in a very precisely defined tissue volume after excitation by UV laser pulses. The fluorescence excitation is achieved by the nanosecond pulse of a frequency-tripled Nd:YAG laser at a wavelength of 355 nm. The detection of the fluorescence is achieved via a photomultiplier and signal amplifier. 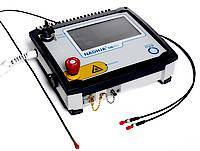 The use of special fibre optic probes allows a wide range of applications. With the NADHJA®-Analyzer it is now possible to measure NADH continuously, invasively or noninvasively, in real time and by laser induction of the photon emission (autofluorescence) of the NADH. The analysis is performed by the excitation of NADH autofluorescence by means of defined laser pulses in the nanosecond range. The selective absorption of NADH in the UV-A range is used. For the measurement no separate fluorescence marker is necessary. The fluorescence pulses are evaluated by a special pulse amplifier which separates the NADH fluorescence from the background fluorescence. You will find detailed information in our folder. Arrange an appointment with us for a demonstration of the device.